Soulcalibur II, the most popular entry in the Soulcalibur series, was the second game my parents bought me for the Gamecube, my first console. It’s got a special place in my heart: it’s the game that sparked my love for what is still the only fighting game series I like, and it’s the only videogame my mother has liked. We’d spend hours dueling, roaring in laughter and endless teasing as we “ringed” each other out by throwing each other outside of a stage’s confines. I passionately kept up with the series until Soulcalibur V, which looked like such a departure that I skipped it entirely, making the wait for Soulcalibur VI feel even longer than it has been. Luckily, it has been worth waiting for. Soulcalibur VI is not only the return to the series’s core that Soulcalibur so desperately needed, but also a step forward into a promising future. It’s an ambitious series that, for better or worse, has always tried to evolve into something more, and it’s great to be thrilled about it again. Even though this game represents Soulcalibur going back to its roots and honing in on what it does best, it has grown to incorporate new aspects that help make it feel fresh and enticing to play after so many years. Soulcalibur VI may be the latest installment in a series that spans a total of 11 main and spin-off entries, but it’s incredibly welcoming to new players. The fighting system is simple, mapping three of your controller’s buttons to horizontal, vertical and kick attacks, with the last button used for guarding. What I’ve always loved about the fighting style in this series is that it’s not just about putting out the most damage or having the flashiest combinations; much of the time, it’s about learning an enemy character’s moves and being able to recognize them in time to guard. It’s about parrying at the right moment, about being quick on your feet and making sure your patterns are unpredictable. It may be easy to learn how to fight, but the knowledge needed to fight well is something you really only get through experience and making the right judgments on the fly. As a result, the combat is in no way shallow despite its simplicity. The addition of Reversal Edge attacks gives the combat system a new flair and an appreciated level of nuance that wasn’t there in most of the game’s predecessors, and Soul Charge attacks make for some dramatic and gorgeous battle sequences that can disrupt a battle’s pace, keeping you on the edge of your seat even if you’ve had an advantage over the other person. While all battles feature two players fighting against each other, online play allows you to create rooms so that you can have a tournament with friends or other players. 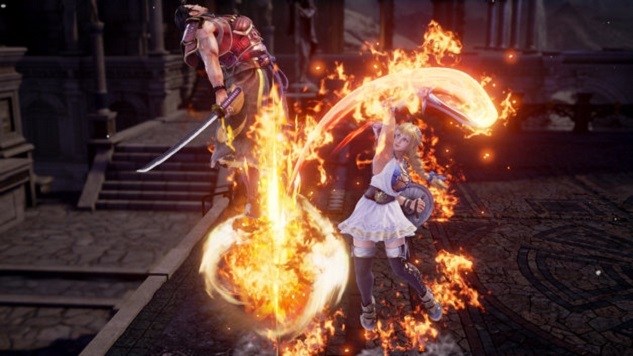 Throughout the week since the game’s release, making use of the game’s easy lobby-making feature has led to hours of laughter, yelling and threats of ending friendships because this is the type of game that can be addicting for competitive people like my friends and I..
For those who lack a competitive streak, Soulcalibur games have included significant story content since the third mainline entry. Soulcalibur VI has two single-player story modes, Libra of Soul and Soul Chronicle, with the latter being more interesting than the former. Soul Chronicle follows the characters in Soulcalibur VI’s sizeable roster, starting with Kilik’s story and then allowing you to play through the stories of the rest of the characters throughout different points in the Soulcalibur timeline. Soul Chronicle plays like a visual novel, containing background music and fully voiced lines of dialogue as you scroll through text and win some fights in between the story content. The fights themselves are often too short and painfully easy; during my fight with the final boss, I landed a perfect round and didn’t pull off anything remarkable to do so. Libra of Soul can be a bit more challenging, but its writing is also much less compelling. There’s too much text for a story that simply isn’t interesting enough even when you’re playing as a self-customized character. Soul Chronicle’s incorporation of voice acting and music does a lot for it, along with its inherent focus on established and beloved characters with unique personalities and various relationship dynamics. Nonetheless, I loved the visual novel style the single player modes have going for them, and despite there being a thing as too much text that leads to a lack of focus, Libra of Soul’s ambition is admirable. This review cannot be complete without praising Soulcalibur VI’s character customization. Yes, there are slightly agonizing load times while switching between some customization options, but it’s a minor issue in the face of the most extensive character creator I have ever seen in a videogame. I spent hours upon hours playing with the color options for the characters and creating my own in Soulcalibur III’s (and Soulcalibur IV’s to a lesser extent) character customization. Soulcalibur VI takes the system I remember so fondly and builds on it so much that I’m still surprised by the creative, ridiculous and brilliant creations people are pulling off and posting on social media. There’s a lot riding on Soulcalibur VI—it almost didn’t happen due to Bandai Namco’s low expectations for the franchise after the decline of its reputation, so it took producer Motohiro Okubo a hefty amount of convincing to be given the opportunity to reboot the series. As a result, it can make or break the future of the Soulcalibur series. If this is any sign as to what will come for the series in the future, I’m not too worried as a longtime fan who had lost interest several years ago. I may not be home and able to play this latest entry with my mother, but it feels wonderful to call her and tell her that there’s a new Soulcalibur game that’s pretty dang good despite some relatively minor flaws; that characters we loved like Talim, Taki and Xianghua have returned; and that I’m making new memories with beloved friends so amusing that I’ve already begun to record them. Soulcalibur VI isn’t just a reboot—it’s a revitalization, and it proves that the tale of souls and swords still has the potential to be eternally retold. Soulcalibur VI was developed and published by Bandai Namco. Our review is based on the PlayStation 4 version. It is also available for Xbox One and PC.